Harrison Ford is trading in his wookie and nerf herder to hang out with a bunch of military brats. Orson Scott Card's acclaimed novel Ender's Game has been a tempting property to develop into a movie for quite some time. For the past decade, progress on the film project has been slow - partially due to the fact that Card himself refused to "condescend to green screen hollywood" - but the movie is now going ahead and assembling a cast. 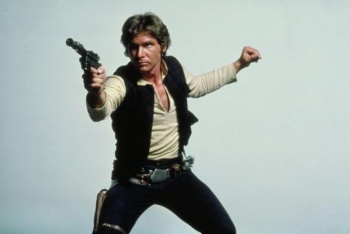 The latest addition to the film is Harrison Ford, who will play Col. Hyram Graff. Graff - for those of you who don't remember - is the man who runs Battle School, manipulating the children who live and train there to save humanity. The character is sort of a villain, thanks to his ruthless tactics, but also shown wrestling with the morality of what he's doing in order to create the military leaders humanity needs in order to survive the interstellar war it's engaged in. As Ender's Game is about children soldiers, Ford is one of the few major adult actors attached to the film adaptation (the other big-name actor is Ben Kingsley as Mazer Rackham). Meanwhile, Ender is being played by Asa Butterfield, Hailee Steinfeld (of True Grit) is playing Petra, Abigail Breslin is going to portray Ender's sister Valentine, while Jimmy Pinchak (from Let Me In) will be Ender's borderline psychotic brother, Peter. Ender's Game is due to hit theaters sometime in 2013.